Prime Minister Hun Sen ended the final event of Cambodia’s Asean chairmanship on Tuesday in tears, excusing himself from answering journalists’ questions due to exhaustion. Local and international journalists gathered in Mr. Hun Sen’s Peace Palace building, ready to pitch questions to the outgoing Asean chair on the numerous controversial issues that have arisen during three days of high-level talks in Phnom Penh. But Mr. Hun Sen, normally a prolific public speaker, delivered a prepared statement and declined to engage with the press. Toward the end of his speech, Mr. Hun Sen began discussing the late King Father Norodom Sihanouk, who died on October 15. “I would like to take this opportunity to respect the soul of the late King Father, who has the title of Preah Borom Ratanak Kout, to be informed that his children have been doing a good job in fulfilling some of the work that was not fulfilled by His Majesty,” Mr. Hun Sen said. Mr. Hun Sen said that the world leaders, with whom he had spent the past few days meeting, had expressed their condolences for the late King Father. He then apologized to the media, stating that he could not take any questions, “because I have been exhausted during the last few days. “And last night, I had a few hours sleep and I hope that my wife prepares to help look after me,” Mr. Hun Sen continued. 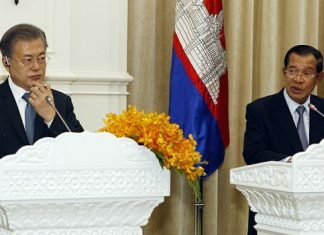 Continuing to apologize for not taking questions, Mr. Hun Sen then began to wipe tears from his eyes. Even the translator serving English-speaking members of the audience appeared to well up in sympathy with Mr. Hun Sen, struggling to interpret the prime minister’s final words. The emotional ending contrasted with Mr. Hun Sen’s last questions and answers session with journalists covering the Asean meetings. At the close of the Asean Summit in April in Phnom Penh, Mr. Hun Sen baffled reporters by saving his final comments to lash out at opposition leader Sam Rainsy and an independent political analyst who had suggested Cambodia was protecting China’s interests in Asean talks. On Tuesday, reporters were likely not short of questions for Mr. Hun Sen and the Cambodian delegation, which has this week made statements later contradicted by fellow members of Asean, in particular in relation to a territorial dispute in the South China Sea. Cambodia’s insistence that Asean was in “consensus” over the maritime issue was immediately challenged by the Philippines, once again raising the suggestion that Cambodia was under the influence of China—which pledged nearly $53 million to Cambodia on Sunday. On wrangling over the South China Sea, which has drawn headlines in the international press, Mr. Hun Sen gave only a brief description in a prepared statement closing the meeting. “On the issues of the South China Sea, the Asean leaders agree to continue to address this issues in the existing Asean-China framework,” he said.